Jenny Mardis received her MBA in the fall of 2013 and started with MPAH in November of 2018. She has joined our Practice after spending several years in management at a human clinic for Rheumatology and Arthritis. She is honored to be a part of such a caring family here at MPAH and works to carry forward the MPAH traditions of compassion and education for all Patients, and their Parents. At home Jenny has a Sun Conure named Nigel or “The Beast”, and a sweet little Shih Tzu named Trixie. She enjoys spending time with her family, listening to stand-up comedy, and watching MST3K movies- really anything to keep her laughing. Casey never had pets (other than fish) as a child so the idea of working in an animal hospital had never really occurred to her. Yet, she lucked into finding a job in a field that she truly loves! 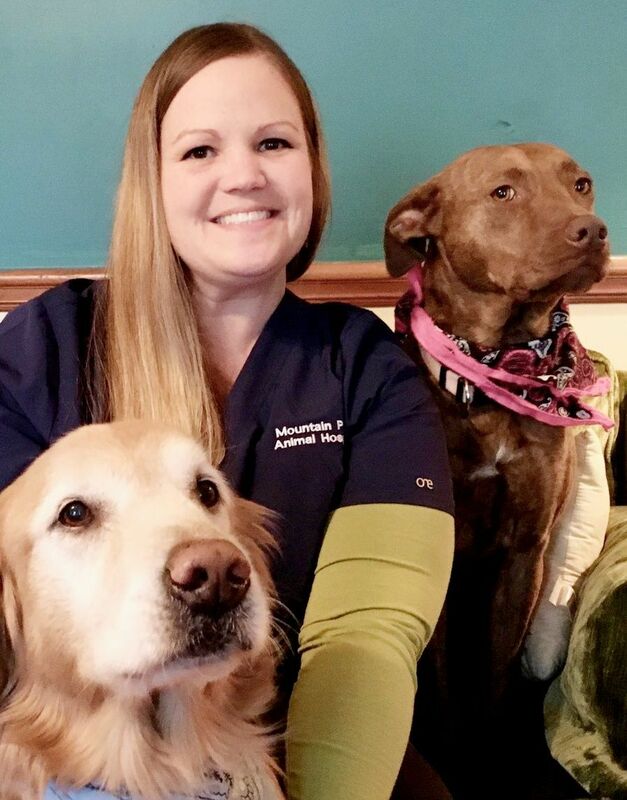 While working at a daycare center she heard about a position available here at Mountain Park Animal Hospital and decided to apply. In November 2001 she came to work at MPAH and, she's been here ever since! She was born in Houston, Texas and grew up in Wilmington, Delaware and moved to Lawrenceville just prior to starting high school. After working at our hospital for several years Casey took veterinary technician classes. She also took and passed the Veterinary Technician Boards and became a Registered Veterinary Technician. Some of her duties include: working and helping the doctors in exam rooms and surgery, educating clients and training new employees. Casey is all our Kennel Manager and keeps the boarding area running smoothly. Casey is married and has 3 children as well as numerous pet children. Her husband, Mitch, is an Information Technology Specialist. Her boys Shaun, Connor and Finnegan enjoy playing, reading, and playing with the animals as well as toys and video games. When she has free time Casey enjoys reading, watching TV, playing with her kids and cooking. 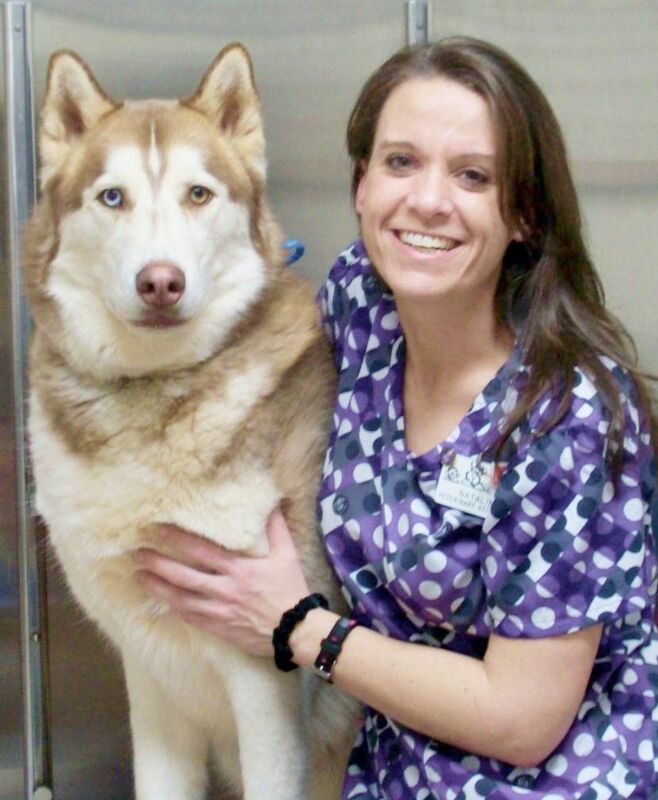 Natalie has been an assistant at Mountain Park Animal Hospital since September of 2009. Animals have always been a large part of Natalie's life since she was a young child. Although born in North Carolina, Natalie has spent most of her life living in the Stone Mountain area. While growing up Natalie's family always had multiple dogs with the occasional hamster or two in the house. Her love of dogs was acquired with a special dog named "Sproccoli, a rescued hound mix who would take Natalie to the park on their daily walks. Later the Siberian Husky breed snuck in to steal her heart with their clown-like personalities, a stubborness to match her own and their beautiful "singing" abilities. She has had four Huskies in her adult life. Currently she has "Malakai" and "Mocha" who keep her busy with their silly antics. Natalie has an interest in canine seizure disorders as her current Husky is epileptic. In her free time Natalie enjoys reading an spending time with her family, especially her niece and nephews. She is also a huge Disney fan! Hello! My name is Jennifer, and I was born and raised in Georgia. I attended the Grayson High School Veterinary Program, and graduated from Parkview High school in 2015. I have been working at Mountain Park Animal Hospital since the summer of 2015, and I have loved every minute of working here! I’ve always had a passion for giving to others, and immediately knew since I could answer the question “What do you want to be when you grow up?” that I wanted to help animals. I have always grown up with critters in my house. I currently have two cats named Luna and Lucky; a dog named Candy; two hamsters named Mr. Beans and Churro; four fire belly toads; and three freshwater fish aquariums. During my free time I enjoy playing video games, cleaning, and taking care of my fur babies! I am currently in school at Gwinnett Technical College to become a Vet Tech- I can not wait to meet and take care of your babies! Julie discovered her love of Veterinary medicine while in college at UGA, when she began working at their school of Veterinary Medicine. From there she began work in Emergency Veterinary Medicine and continued in this field for over a decade. In the years prior to joining MPAH she expanded her knowledge by working in shelter medicine. She then joined the MPAH family in November of 2016 as a Veterinary Assistant. Julie is a Georgia native and lives locally with her family of humans and animals alike. In her off time she enjoys spending time with her family, hiking, reading, and photography. Lauren has always loved animals, and wanted to become a Vet. Growing up she took horseback lessons, and taught kids how to ride as well for 10 years. Born and raised right here in Gwinnett County, Lauren had several gerbils, two ferrets, two dogs and a cat growing up. Lauren started online classes to become a registered Vet Tech, and decided to ask Dr. B if she could shadow or have an internship to see firsthand what a Vet does on a daily basis, and see if she could overcome her fear of needles. During her shadow interview with Natalie, they were in a room with a Client, and as soon as the needles came out Lauren lost all color and had to sit. Natalie told her that she’d probably never be able to be a Vet Tech. In 2017, Lauren started working as a receptionist and loves it! In her free time she loves to spend time with her dog, sewing, painting, and make jewelry. Sheri is your classic crazy cat lady, currently belonging to four lovely cats. Shown here are two of her loves, Edward and Blazer. She is also crazy about dogs, small furry animals, feathered animals, babies, children, and pretty much anyone who will allow her to feed them. Sheri is an Atlanta native, as is her husband of 25 years. They have two gorgeous young adult daughters who have made them the proud grandparents of a Basset Hound and a Ball Python. Sheri previously has worked as a medical secretary/receptionist in the fields of Infectious Diseases, Nephrology, Pulmonology, Podiatry, and Pediatrics, as well as in a Grant Office, Statistics, and in Real Estate. Finally, she was lucky enough to land a job working here, with her passion: pets and the humans who love them; plus, it’s practically in walking distance from her home. Sheri is proud to have been working for MPAH since May of 2017. My name is Bobbi Jo Lahl. I have been apart of the amazing team here at Mountain Park Animal Hospital since September 2018. My husband Tony and I live in Lilburn with our tiny human Russell James (October 2018). We love our little town and being parents. We have two fur babies, Winston, a German Shepherd Mix (September 2014) and Gus, a black Lab and Hound Mix (April 2016). We keep our boys social and active at the parks and take them to restaurants that welcome furry kids. Outside of the hospital we enjoy spending time with family and friends. We love to host bonfires and game nights, enjoy long weekends at the lake and any event that involves a food truck. Hi, my name is Christy Thomas and I have worked at MPAH since February 2016 and love it so much! I grew up in an animal loving household where we had everything from goats, chickens, dogs and cats; to the occasional rescuing of squirrels, lizards, baby rabbits, birds, and a baby opossum. We also owned a few frogs, a salamander, snakes and various rodents. No animal was a stranger in our home. I grew up in Lilburn, was homeschooled, and currently live in Snellville with my love, Jacob and our beautiful daughter, Nova. We have 2 dogs, Kira, a Rat Terrier, Dobby, a Dachshund, and 4 black cats named, Loki, Smokey, Zero and Smeagol. Our house is full of love, fun and fur! I have always wanted to have a job working with animals and am so blessed to work with the amazing team at MPAH! Hey Everybody!!! My name is Kalan, and I’ve been working at this outstanding hospital as an Assistant for three years now! I am currently attending Georgia State University as an undergraduate to achieve my Bachelors degree in Nursing. I also attended Grayson High School for their amazing Veterinary Medicine program. Outside of work, I have a burning passion for soccer and various exotic cars. My favorite soccer athlete is Neymar Jr. and my favorite car is the McLaren 675LT.